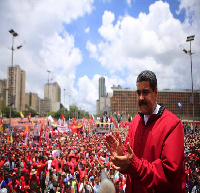 Host Sylvia speaks to Raul Burbano from Common Frontiers about the ongoing Coup attempts in Venezuela, why Venezuela has been singled out and the role of ordinary citizens in holding their governments like Canada accountable when they endorse these illegal actions in our name. This entry was posted in Uncategorized and tagged be the media, bloggers, borders, capitalism, Common Frontiers, community, dispatches, Flesh Mapping, global news, Honduras, how to listen, international, internet, interviews, itunes, Latin America, latin waves media, media, media democracy, membership, Michael Albert, movements, nother world is possible, participatory economy, passion, Peace, Podcasting, political, politics, radio, Raul Burbano, Revolution, social change, sound, Stuart Richardson, Sylvia Richardson, Venezuela. Bookmark the permalink.